We need to recognize that the tax code is the major problem, and it needs to be revised. "The central belief of every moron is that he is the victim of a mysterious conspiracy against his common rights and true deserts. He ascribes all his failure to get on in the world, all of his congenital incapacity and damfoolishness, to the machinations of werewolves assembled in Wall Street, or some other such den of infamy. If these villains could be put down, he holds, he would at once become rich, powerful and eminent. Nine politicians out of every ten, of whatever party, live and have their being by promising to perform this putting down. In brief, they are knaves who maintain themselves by preying on the idiotic vanities and pathetic hopes of half-wits." Since the left controls the Justice system how do you explain this? 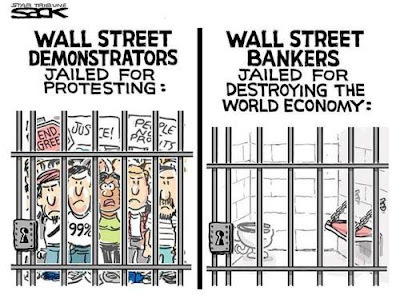 I explain it by noticing that the criminals that broke the law were arrested. Anon 7:18 said "the left controls the Justice system"
Ah hah! 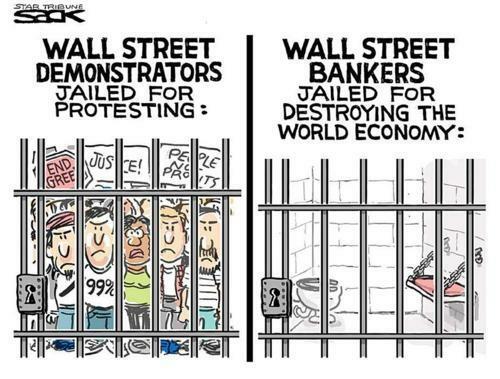 So the Wall Street Protesters broke the law and were arrested, and the Wall Street Bankers didn't and were not arrested. Why didn't JW figure this out? I'm pretty sure that the constitution guarantees the right to peaceably assemble in protest. Also confident that fraudulent financial schemes are illegal. Who thinks "the left" controls the justice system? What kind of evidence supports that absurd contention? The primary criminals have not been arrested. The loving, peaceful, tolerant children you have so carefully nourished with your supportive words have created this sweet video montage to show their appreciation for your dedication to their continued development. But how does that improve the dialogue?